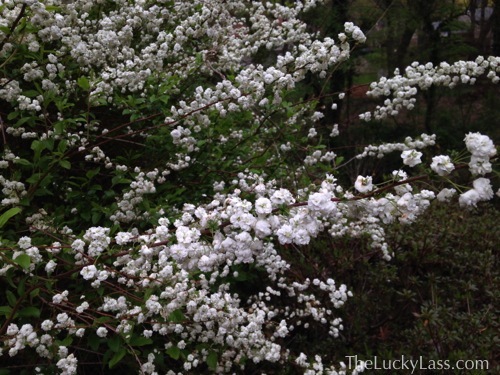 This post is a little late coming, but as this also counts as my garden journal, I wanted to record the last two weeks of blooms before posting the peak of the azaleas (otherwise known as the peak of Spring, maybe the year). All of the narcissus finished up over the course of the last two weeks. I was gone for one whole week, visiting my sister in California. 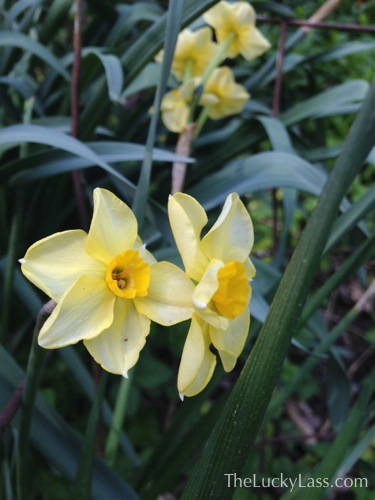 I think while I was away I missed the peak of the latest blooming daffodils and jonquils, but there were a few left. 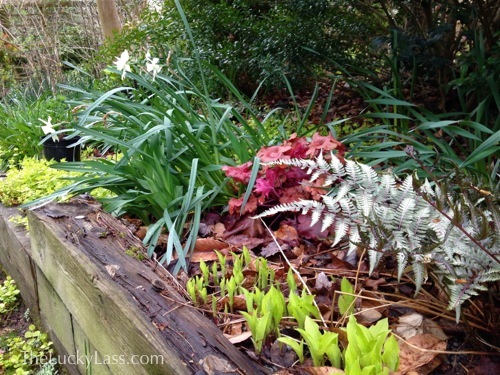 These pretty white daffodils made a nice vignette with the newly emerging mini hostas, Japanese painted fern, and ‘Fire Chief’ Heuchera. I was pleasantly surprised that I placed the Heuchera just right. 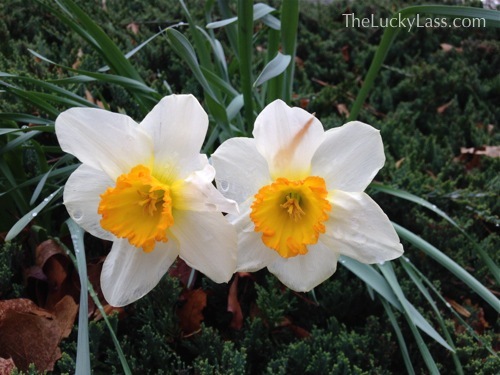 Here’s another shot of those white daffodils. There’s another patch of them in the lower garden, which this year included a deformed cup on one. 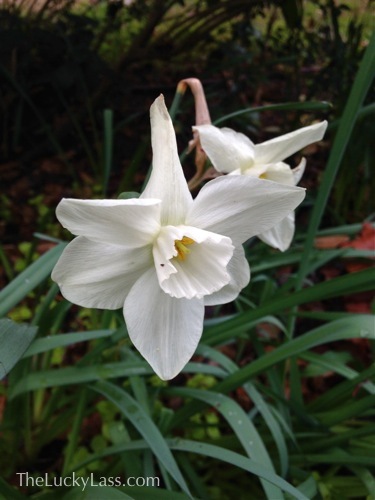 Continuing with the white theme, this one up near the yews by the driveway had a pale yellow tipped cup. 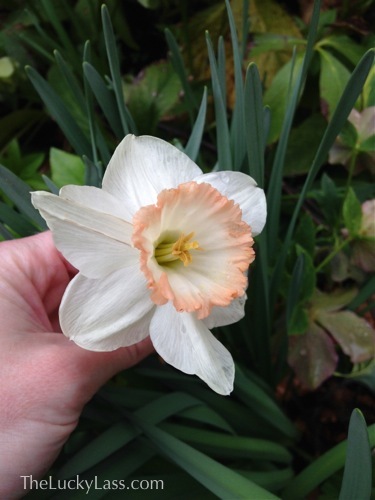 Another white with a pink frilled cup located in the side, front bed. And the latest bloomers next to the driveway. I still need to go back through the plant tags to see if I can name any of them. 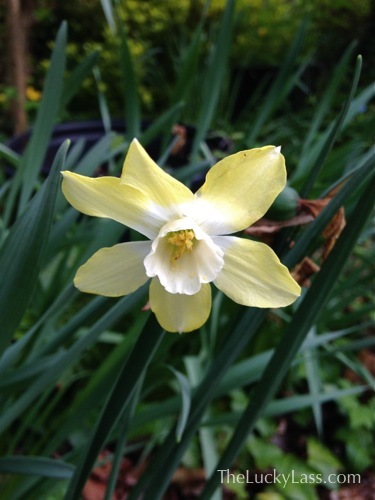 There were several groupings of jonquils out later in the season, including this striking yellow petaled, white cupped variety. 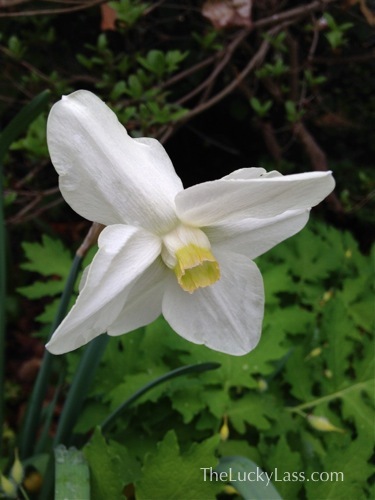 The jonquils tend to have smaller flowers and multiple heads on each stalk. 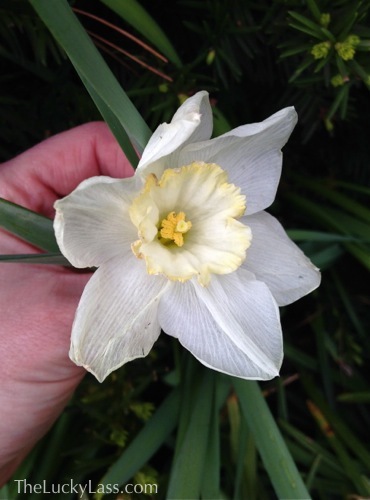 This pale yellow variety has a small darker cup. And lastly these sweet little beauties. 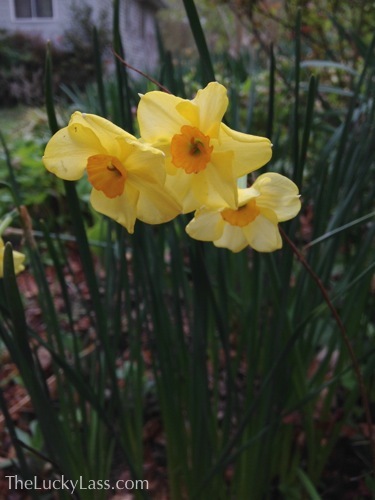 I’ll have to check any notes and photos, but I don’t know that the daffodils lasted as long this year. Or maybe it just feels that way because of being gone for a week in the middle of it all. There is so much that is going on in the garden, I feel as though I have to go out nearly every day or else I might miss an ephemeral bloom. This year I caught the Japanese Acuba flowering- which I haven’t seen before. Another short blooming plant is the Virginia Bluebell. I was very excited to see this shot of color behind the garden bench. 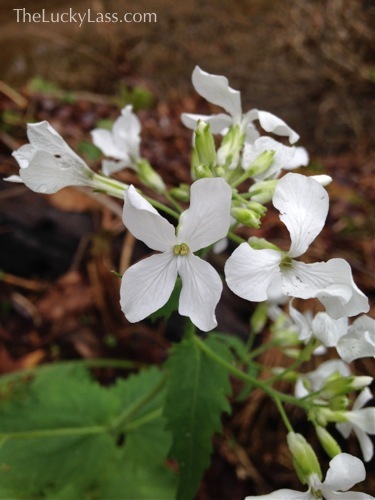 I don’t remember this plant from last year, but I think it’s Dame’s Rocket and it’s blooming on the edge of the garden by the creek. It almost looks like a weed, but if it is what I think it is it’s a native Virginia wildflower. 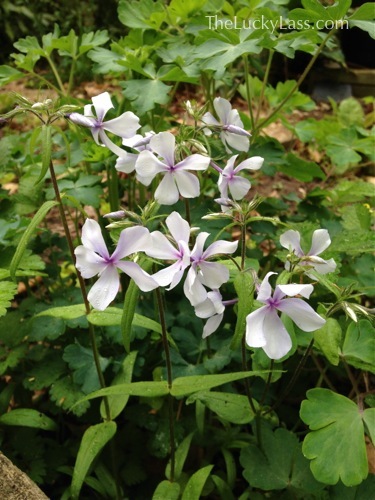 Somewhat similar, but more recognizable is this early garden phlox. I think it might be a Carolina variety. 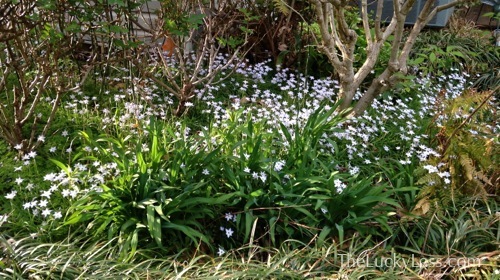 Most people only know about the creeping phlox which carpets hillsides and patches in people’s gardens in early spring. I’m surprised mine are still blooming! 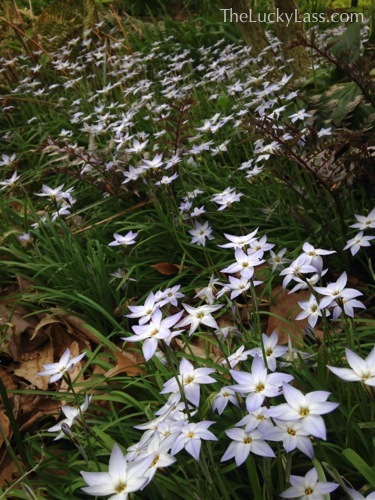 Another flower that has just about run it’s course is the Spring Starflower. This pretty little flower carpets the side yard. It looks really good at dusk too- like little points of light on the ground. The rest of the year it looks sort of like messy grass. I don’t mind it though….for now. I think it likes to spread quite a bit on its own though, as I’ve found little pockets of it everywhere. 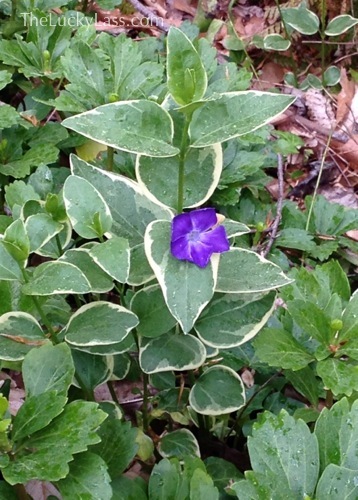 Another troublesome spreader is the variegated vinca, flowering now. I don’t mind some of it, but it also starts to look messy after a bit- especially when it seems to be just a bit here and there. Another potentially troublesome spreader is the Lamiastrum. 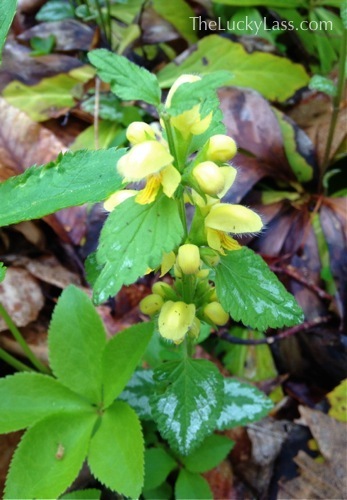 This has taken over as a ground cover in part of the lower garden, and has these pretty little yellow flowers for a short time. I think the foliage is what makes this plant interesting. 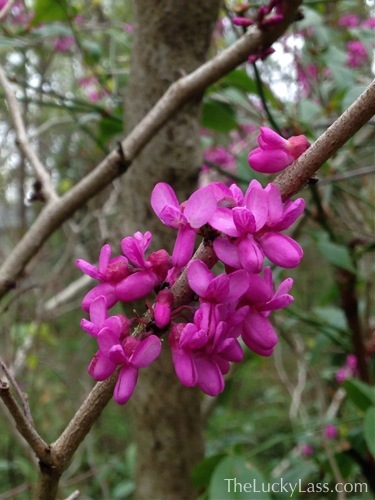 Two weeks ago I showed the Redbud just starting to show and now it’s starting to fade too! But not before I caught a detail of those pretty pink flowers. 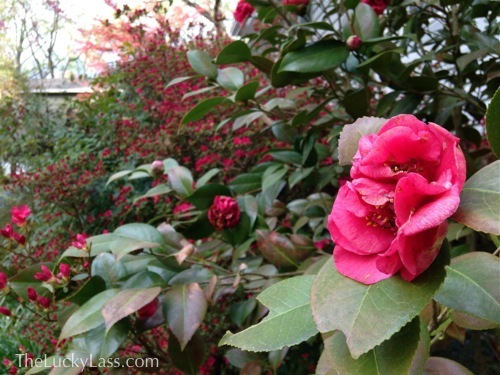 Another pretty dark pink, almost red, is the Camillia out front on the corner. Here is a shot with a bloom at just the very beginning of the pink azalea behind it. 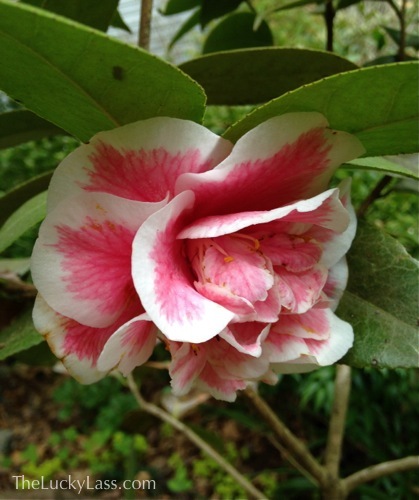 The pink and white striped Camillia I had on last week, is actually supposed to look like this I think. 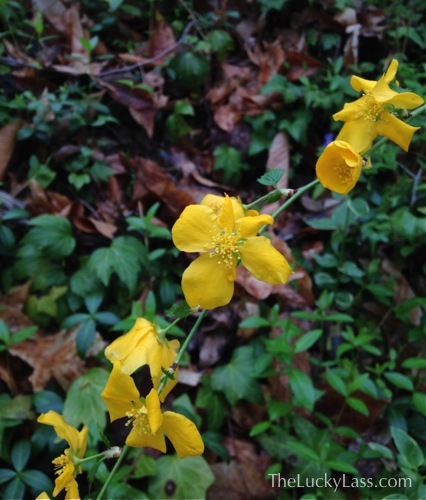 I found this bloom on the same bush, hidden in the middle under some leaves. It is so pretty! I want to see more blooms like this so I think I’m going to find out how to care for this plant better. And lastly, an unidentified flower on the back slope. I have looked quite a bit to try and figure this out, and I think it may be a wild rose. I need to get a better picture of the leaves, and see if there are any ‘rose hips’ later. Even though it looks really similar, I know it’s not the Yellow Marsh Marigold. The leaves and the structure are different. I wanted to leave this post with a shot of the back yard from the 17th, because it’s already changed so much. 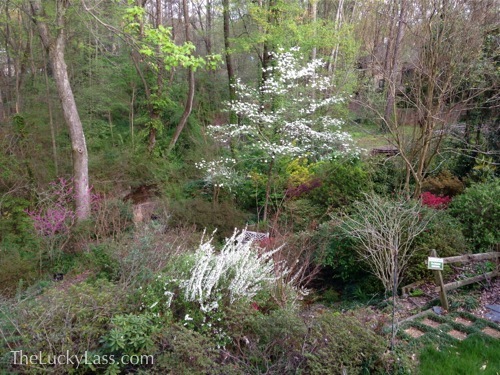 In this shot, you can see the redbud blooming at the left, the bridal veil Spirea is up front, a white Dogwood is near the back, with a Japanese maple just below it (dark purple) and Euonymous (yellow), and an early azalea (bright pink) on the right. So many changes, it can be hard to keep up! 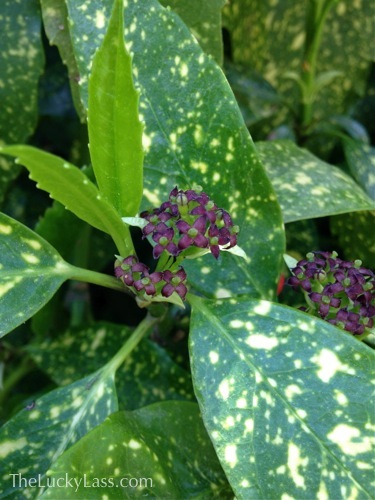 I love the polka-dotted leaves of the Japanese Acuba, so cute! 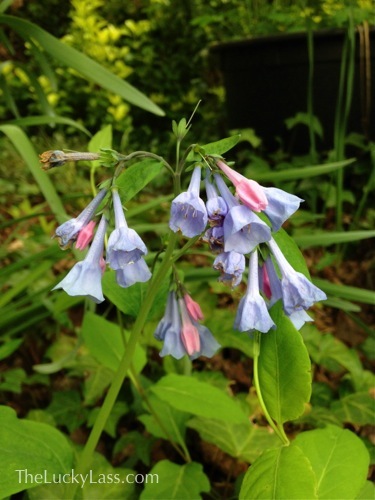 I also like how the Virginia Bluebell starts out with pink buds and that turn blue as they mature. 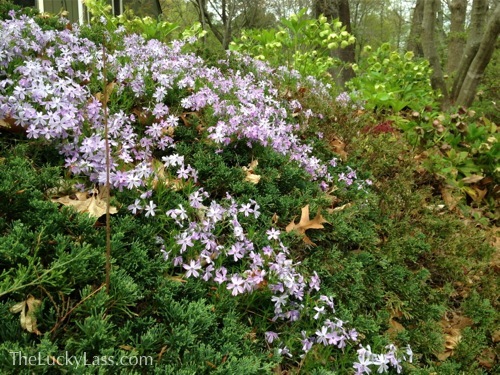 I think I have Spring Starflowers, are they very aromatic and grow in clumps? If so that’s what I have bordering the rocks around the firepit. The foliage is dense enough to keep the mulch out of the pea gravel. Thanks Lisa! I thought that was cool about the Virginia Bluebell too :) The Spring Starflower does grow in clumps but I’m not sure about the fragrance. I’m allergic to so much pollen that I try not to take it deep deep breaths while outside.